Mark Davis hired a man off the teevee, again. Mike Mayock, who has never worked in an NFL front office but has worked for NFL Network since 2004, will be the next GM of the Oakland(?) Raiders, according to ESPN. He replaces Reggie McKenzie, who was fired earlier this month because the Raiders’ grand plan has always been to give Jon Gruden pretty much unlimited power. Therein lies the reason this hire might be perfectly fine—or at least, not all that weird. Despite getting the GM title, final personnel decisions are going to be made by Gruden. 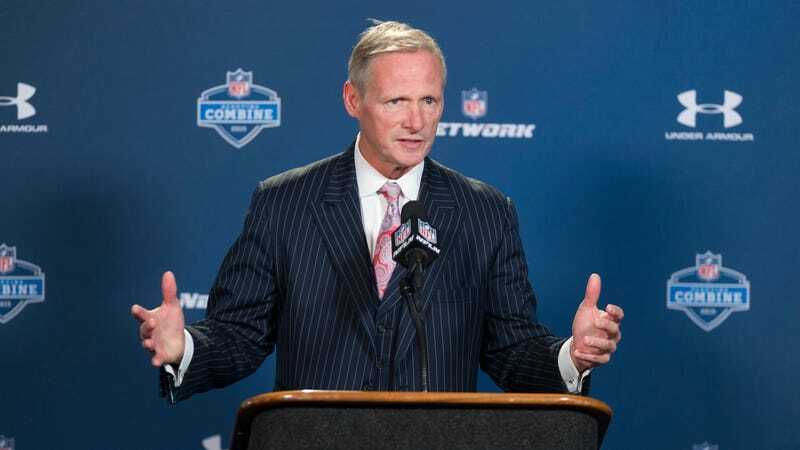 Mayock’s here for what he does best, which is player evaluation. He presumably understands that fact coming in, and because he’s never worked for a team before, doesn’t expect anything different. So maybe this works, with Mayock doing what he’s always done, only this time for a much-reduced audience. And since it’s his first front-office gig, he won’t balk at that; former Giants GM Jerry Reese turned down an invitation to interview for the job, reportedly because he wasn’t interested in a gig where he’d have to defer on every decision. Gruden seemed pleased, anyway, when asked yesterday about Mayock, who was already rumored to be the favorite for the job.